These words have been embedded in Casey Lewis’s mind since she began building her business nearly a decade ago. Since opening her salon in March of 2011, she has branded herself and her businesses to attract like-minded, well-intentioned people from all walks of life. This is Casey’s story [with some insight from her best friend, right-hand woman, and salon manager, Kate]. Salon ownership is not a career path that Casey remembers anticipating for herself when she began pursuing her licensure. However, when she found Willow Room’s current location, she instantly fell in love with the space and began envisioning it as her own. The space Casey acquired had to be transformed into a functioning salon—and fast. She received the keys January 1st, 2011 with a plan to open in May of the same year, however, complications ensued and the plan quickly changed. Casey was unexpectedly tasked with renovating the space in just four weeks. Everything you see in the salon is repurposed and upcycled wood and furniture from northeast Ohio. 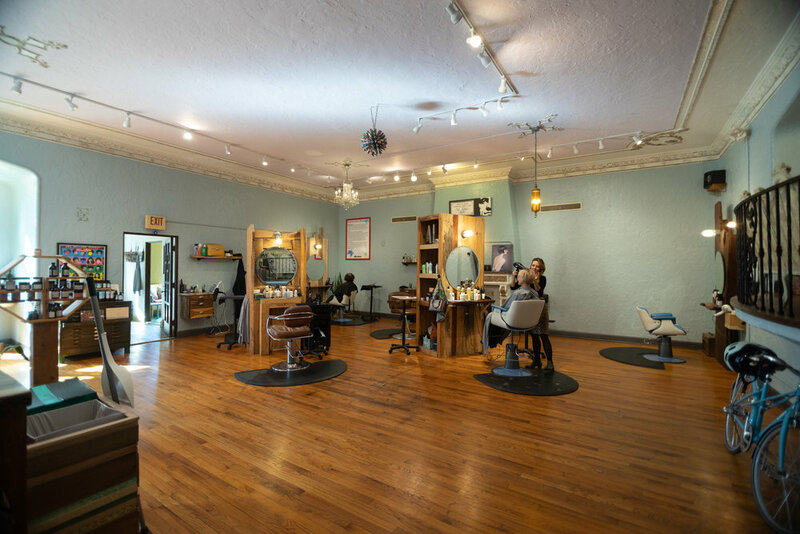 In fact, during their first year in business, Willow Room Salon took second place in an international eco-salon design contest held by Davines North America, the brand Willow Room proudly carries as their product line. Willow Room’s eco-friendly drive does not stop with their salon design. Casey’s salon has been certified as environmentally friendly through Green Circle Salons for the past few years. Though she has actively been pursuing ways to support and protect the world around her, Casey admits that she did not adopt the idea of a brand until about a year or so ago. It is Casey’s well-intentioned vision that brought her to partner with Cleveland’s May Dugan Center, a local social service organization that has committed themselves to helping people enrich and advance their lives and communities, to create the Suspended Beauty program. The experience provided by Willow Room and May Dugan is more about just getting your hair cut, it’s an experience. To fund the program, Casey has asked the Willow Room community to donate any dollar amount which then goes into a bank to covers stylists to service May Dugan clients at no cost. Over the past few years, Casey has accepted the role of being a leader and has hired a team of full-time stylists. Casey acknowledges that one of her most important hires in this transition was the addition of her best friend Kate as Willow Room’s manager. Since Kate has been working in the salon, there has been a huge shift in dynamics that has empowered Casey to come out from behind the chair and focus on the business again—a transition that has aided in Willow Room’s expansion of wellness programming. 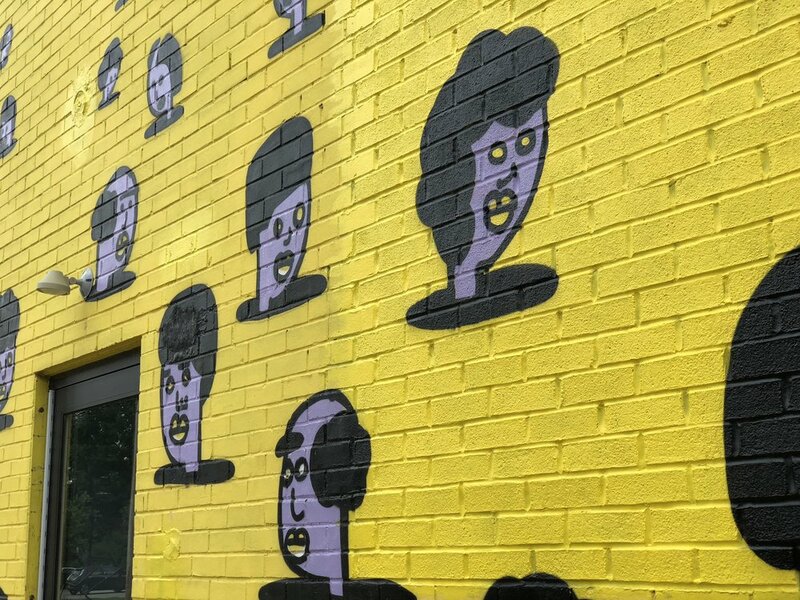 In early 2018, Casey was given the opportunity to expand her space to include an attached event space, office, and break room for her staff. The space is appropriately titled Glasshouse Project, which was birthed from a distant memory coupled with an inspiring conversation with Anne Hartnett of Harness Cycles. Glasshouse was created with self-care in mind. Casey knows that the salon industry is notorious for long hours without breaks, so she wanted to include a space in her salon where her staff can sit back and relax, practice yoga, meditate, and breathe. But the intention for the space involves the community, as well. Casey sees Glasshouse as a container space for creatives. It’s a space where people who are doing inspirational work are invited to create and collaborate. And, eventually, she would love to extend Suspended Beauty into Glasshouse to provide public services and education opportunities for those in need. In the long term, Casey wants people to grow within the Glasshouse walls. And she, herself, is taking full advantage of the growth that the space allows for. Casey feels as though the heartbeat of the world right now stems from the need for honest, open connection with people, and redefining that being self-serving, and doing things that are right for you, is not a bad thing. She believes that unless you are true to you, you are not where you are supposed to be, and that the more self-serving you are, the more good you have for everyone around you.